Our hamentashen feature a meltingly delicious cookie dough with sweet smooth fillings of jam. These tri-cornered sugary cookies are drool-worthy! Our walnut brownies are moist, chocolatey, and filled with freshly ground walnuts. Topped with chopped walnuts for that crunchy taste. Our brownies are an amazing blend of rich brownie and perfectly creamy cheesecake. It's layered with a cream cheese filling and then marbled to create layers and swirls of cheesecake within the brownie. Prettiest and tastiest dessert of all time! 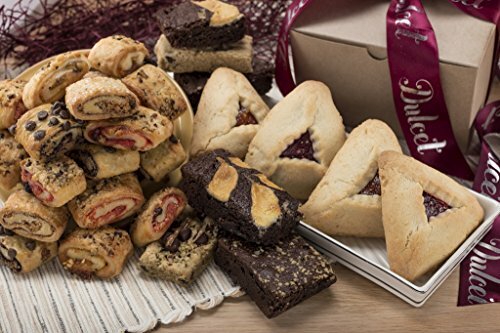 Our rugelach will warm the heart of every taster! A satiny soft dough wraps around an assortment of fillings: cinnamon, chocolate chip, raspberry and apricot. Dulcet Get Well Soon Gift Basket – Lovely Reusable Cookie Tin Loaded with a Fine Variety of Pastries to Convey Get Well Wishes & Boost Spirits!